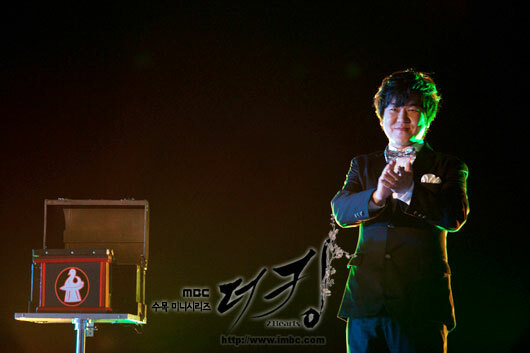 In MBC new drama series The King 2hearts, Yoon Je Moon transformed startlingly into an insane magician. In The King 2 Hearts that is broadcast after The Moon Embracing the Sun, Yoon Je Moon is playing the role of Kim Bong Goo, the president of holding company of multinational military complex Club M which has dominant influence around the whole word on the basis of huge funding support. He is called “insane,” and is engaging in extreme confrontation with Korean royal family. He is a full of character but deadly villain. The transformation of Yoon Je Moon into magician is broadcast in 2nd episode. As the president of Club M, Yoon Je Moon will perform to clients the ‘surprise magic’ of letting pigeon flies out of box. Even though he is not a magician, but has shown the image that not inferior of a magicina, heightened the expectation towards the role of Yoon Je Moon. The shooting was done on the morning of February 16th, 2012 at a resort on Jeju Island. On the scene, Yoon Je Moon wore a demure black suit, with a cute silver bow tied on his neck, appearing in magician transformation. Yoon Je Moon was learning magic for the first time for the shooting. 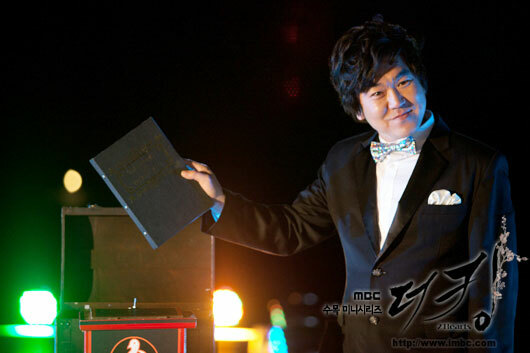 The magic was taught by famous magician Kim Joo during the spare time during filming. Yoon Je Moon learned from the most simple card trick to the different magic performance, learning various kind of magic, letting the filming of the magic performance becomes more vivid. Filmmaker Kim Jong Hak Production said, "So far, Yoon Je Moon is showing unique and strong personality at the same time as the village in The King 2 Hearts. Yoon Je Moon is putting in a lot of efforts into the acting for playing the antagonist role for the first time. Please looking forward to Yoon Je Moon who emerges as the new villain."